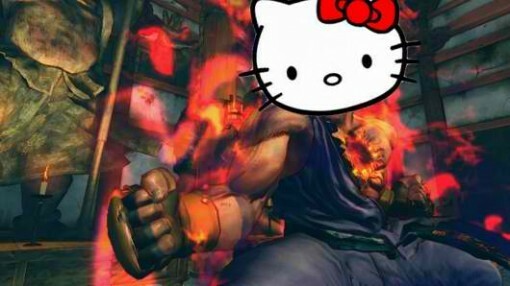 Anyhow, the guys behind the two franchises – Hello Kitty and Street Fighter – have made an announcement that will either thrill you or give you the chills (not the good kind). In 2012, merchandise featuring the two brands will be released worldwide. I know what you’re thinking…what in the world will the merchandise look like? Specific details have not been announced, but in the press release, they did mention something about “a broad range of merchandise featuring Hello Kitty dressed in the distinct costumes from the Street Fighter series of video games”. All sorts of images are flashing in my head. A muscular cat dressed in martial arts costume. The Street Fighter characters wearing pink. Oh the horror! But wait – there’s more! It might just be possible that the collaboration between Sanrio and Capcom does not stop at manufacturing merchandise. Some speculation about a game combining the two franchises might result as well. Kill me now. Why would anyone who enjoys playing Street Fighter want to play a game that incorporates a cat that likes pink? What was Capcom thinking? Really??? Even though Joshua Izzo (Director of Licensing of Capcom) states that “Capcom has long admired Sanrio and their ability to create memorable and cherished lifestyle brands so it is a distinct pleasure to partner with them for this new cross-over line of merchandise. The combination of Hello Kitty and Street Fighter will offer fans a whole new way to experience our characters,” I am so not convinced. Or am I just too biased against Hello Kitty?